"Hathaway's Stable on Mechanic Street (now Princess Street) featured this six-horse barge, 'The Queen of the Turf.' The barges were rented from a livery stable and were used as a charter bus. 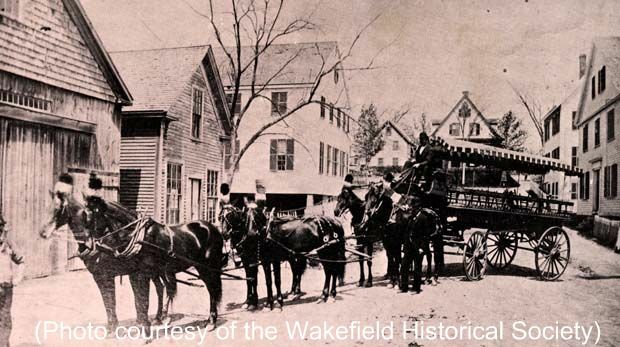 The original Hathaway Stable was destroyed by fire on October 23, 1899. In 1900, the 'city stable,' owned by George H. Hathaway and managed by Otis M. Cutler boasted a 'new fire proof, steel clad stable acknowledged to be a model.'" -- Text from calendar by Jayne M. D'Onofrio. “Hathaway's six-horse barge, 1885,” NOBLE Digital Heritage, accessed April 20, 2019, https://digitalheritage.noblenet.org/noble/items/show/6977.